Following a strange, yet compelling seven-game series versus the Vancouver Canucks, the Boston Bruins are once again Stanley Cup Champions. Upper Deck is highlighting the team's first Cup since the 1971-72 season with a 31-card box set that includes player cards, season highlights and one over-sized Stanley Cup card. The set carries a suggested price of $20. One 3 1/2 x 8 Commemorative Stanley Cup card. The Bruins' best players are each highlighted on 25 player cards. The checklist includes captain Zdeno Chara, Conn Smythe winner Tim Thomas, rookie Tyler Seguin, Patrice Bergeron and Nathan Horton. Five Season Highlights cards span both the regular- and post-season. The subset celebrates Chara's first career hat trick, Thomas' stellar year in net and Seguin's four-point effort in the Conference Finals. 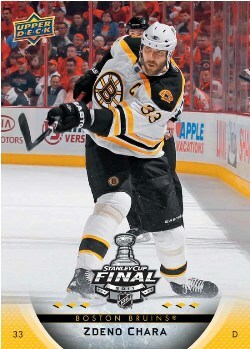 A Stanley Cup Champions commemorative card measures 3.5" by 8". The front features the team celebrating their Cup win, while the back has a beaming Thomas hoisting the Stanley Cup and a game-by-game breakdown of the series. Boston Bruins 2011 Champions Mini Bobble Head Set Lucic Chara + Stanley Cup!